The painting of the Piasa as it appears today in Alton, IL. 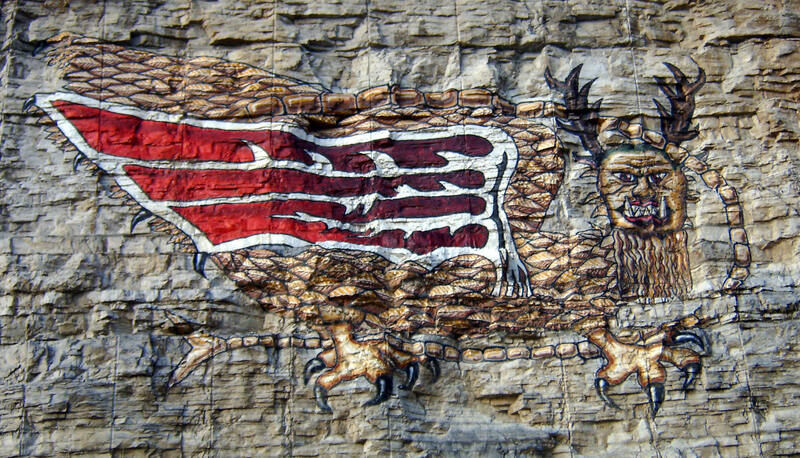 This picture shows the most recent painting of the Piasa. It was created in 1998 by artist Dave Stevens from Godfrey, Illinois and measures 48 feet long and 22 feet high! It's located along the Great River Road in a new facility called the Piasa Park. The park covers an area of 2.5 acres within the old limestone quarry. The park features restrooms, bike trail, small picnic shelter and paved parking. Various renditions of the original pictograph have been painted on the Mississippi River bluff at Alton, since 1924.